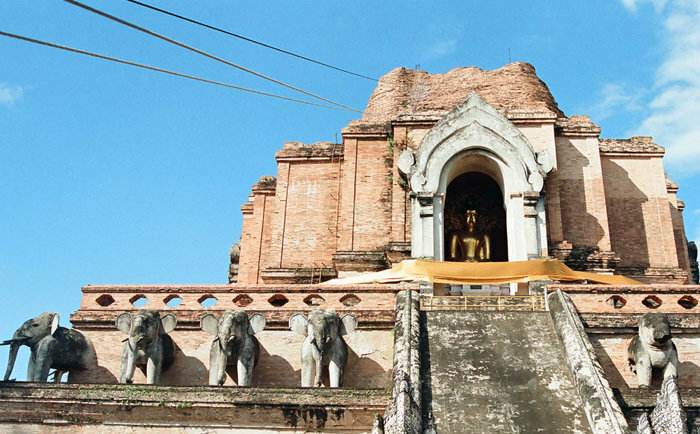 The temple Wat Chedi Luang in Chiang Mai City (Northern Thailand). 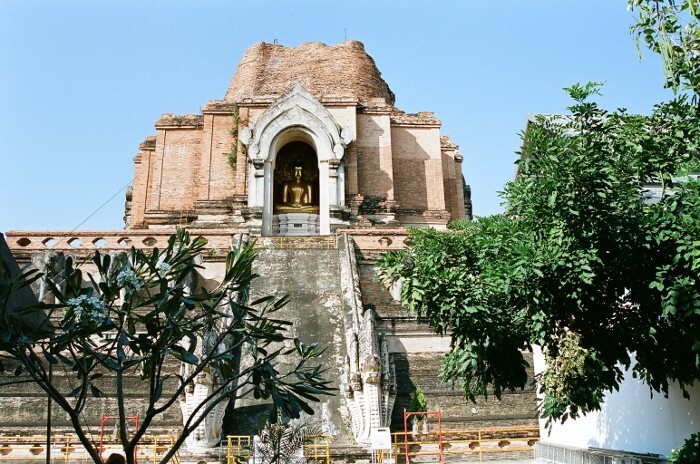 The Wat Chedi Luang is located in Chiang Mai city centre, inside the moat area. 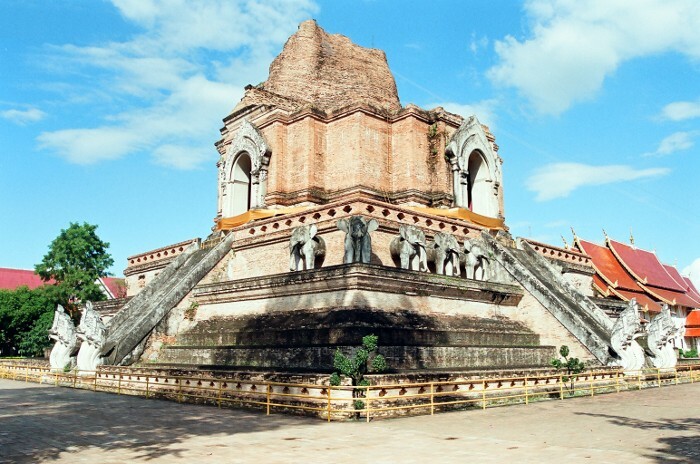 It is characterised by its chedi which is one of the highest in Chiang Mai. Impressive, this temple definitely deserves a visit. 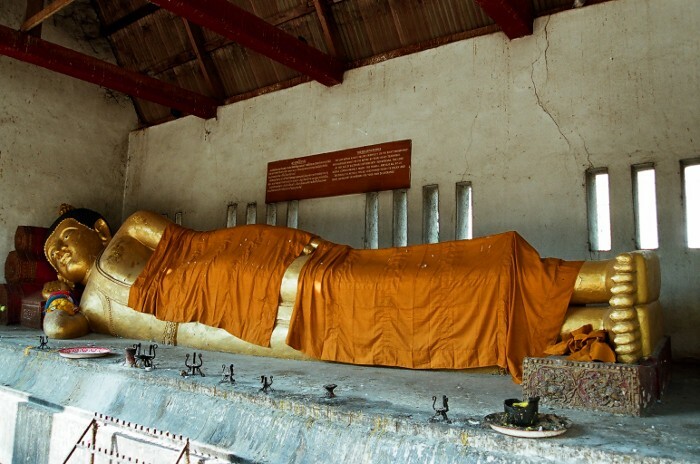 Just next to it, you may also choose to pop in and explore the magnificent Wat Phan Tao, built in teak wood. You can opt to discover the Wat Chedi Luang on a Sunday evening, therefore both attending the Sunday Market (from 5pm, every Sunday, from Wat Phra Singh to Thapae Gate) and enjoying the great lights of Chiang Mai in the night. Nikon F50, lens 28/80mm The Wat Chedi Luang Lanna-style chedi was built in 1441. It was partially destroyed in the 16th Century and was restored thanks to Unesco and Japan funds. 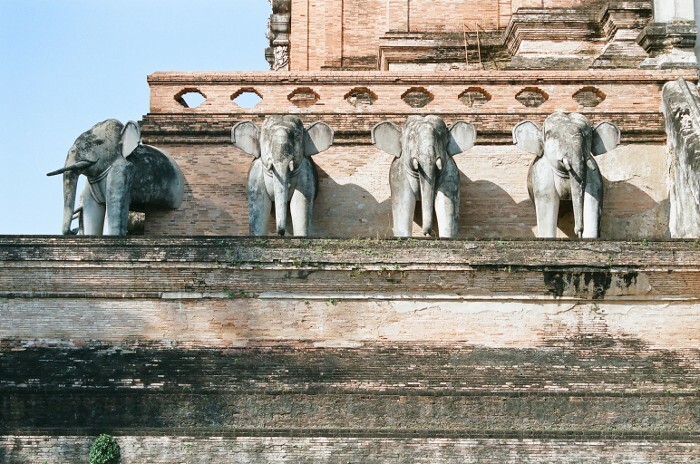 Nikon F50, lens 28/80mm Today one elephant is made in stucco and bricks, the others were rebuilt in cement. 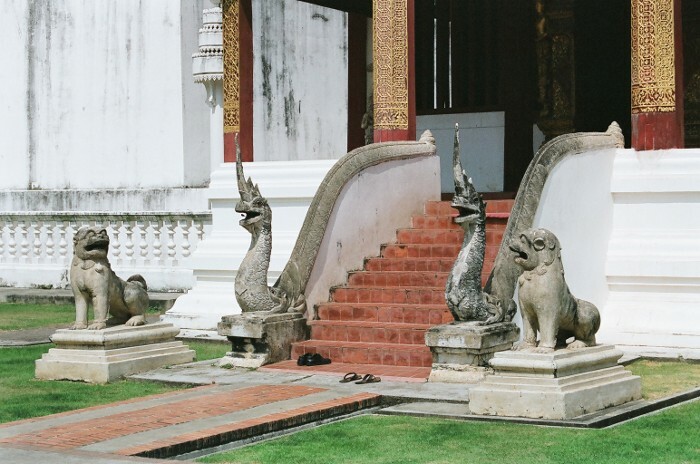 Nikon F50, lens 28/80mm The Wat Chedi Luang. 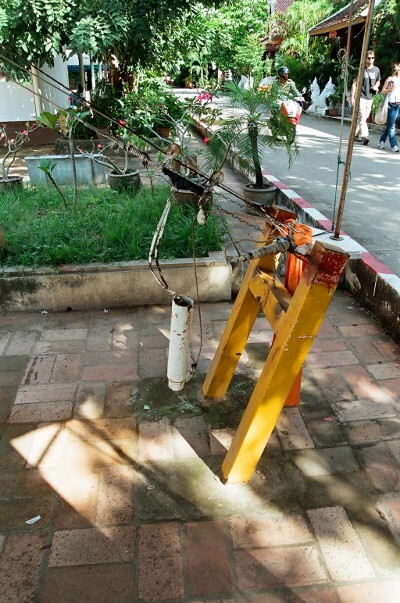 On the left hand side of the picture, there is a cable. 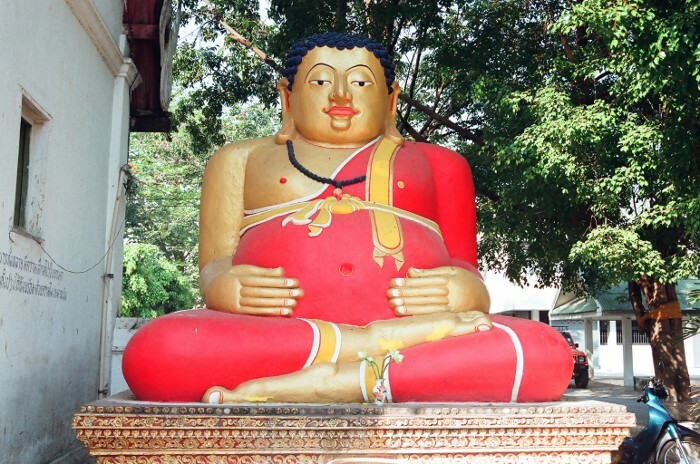 It is used to bring holy water to the sacred relic, located at the top of the chedi. Nikon F50, lens 28/80mm Here, the mechanism is used to bring holy water to the sacred relic. 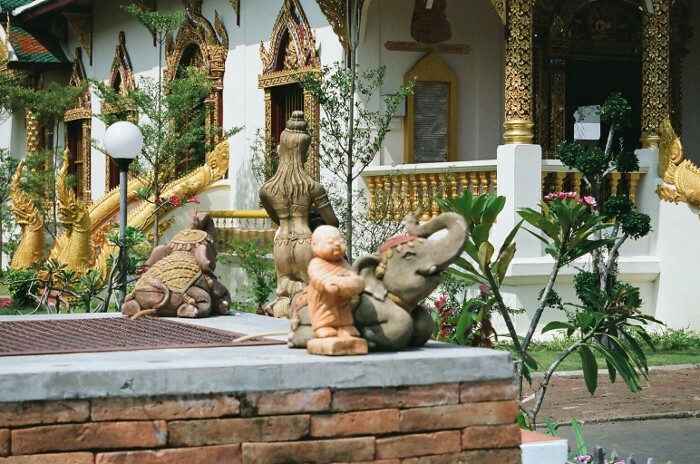 Nikon F50, lens 28/80mm Buddha of Monday: position of the lying Buddha.